When Bob Carr came to one of the park functions in 1988 during the development of Bicentennial Park Stage 1, he likened our campaign for waterfront open space to the Wars of the Roses – Bob’s a history, not a movie, buff! He was, no doubt, conscious of the intrigue, conspiracy and mayhem conducted along the way to our gaining this wonderful park. If you appreciate these qualities in your drama, then the campaign for the Bicentennial Park is right for you. 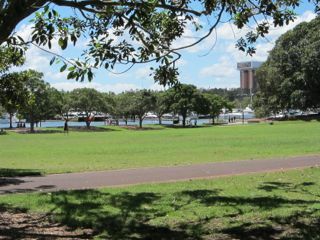 If you want spontaneity as a part of your drama, then the campaign for Blackwattle Bay Park is more your style. But if the drawn out slug is more your liking, then the waterfront walkway is right up your street. Looking back over the Glebe Society’s 40 years (I’m fudging a little here as I can claim only a mere 36 of involvement) it doesn’t seem to have been so difficult. Even if the total project is not quite finished at this stage we have, after all, been enjoying two of our major gains, Bicentennial Park and Blackwattle Bay Park for 20 and 25 years respectively, but it all seemed so difficult back then. And it is worth reminding ourselves that at the formation of the Glebe Society in 1969, there was only one waterfront public open space in Glebe – tiny Pope Paul V1 park at the bottom of Glebe Point Road. Certainly, Nick Greiner was Premier and Leichhardt Council’s personnel was as stated at the laying of the plaque in Bicentennial Park, but these aren’t the personalities who created Bicentennial Park Stage 1. Greiner was significant in our gaining Bicentennial Park Stage 2 but he just happened to be Premier when the plaque was laid for Stage 1. And while a couple of the personnel listed for Council had been great supporters of our campaign, unfortunately some listed were actively opposed to the campaign for the parks. Without dwelling on this, my point is just that the “official” history doesn’t necessarily tell the real story. I intend to. Alan Robertson, one of our Life Members, hasn’t been around Glebe for a long time now but the value of the work he did when he lived in Glebe is incalculable. When I was saddled with the role of the Glebe Society’s convenor of parks and open space, I assumed that I would have to begin some sort of audit of what we had and what we could possibly get. Not so! Alan arrived at my house one evening armed with lists. Lists of titles to properties suitable for addition to our stock of open space; lists of leases on the properties and their duration; lists of other fledgling community organisations with interests similar to ours; lists of contacts who might be able to help further our cause. Most important of all, he came armed with a hand-drawn map of the foreshore of our bays clearly establishing the potential for waterfront open space. Despite the chaos created by the immediacy of the proposed division of Glebe by the expressway, our forefathers had the vision to look beyond the immediate risk to our suburb and develop a vision for the future. We are indebted to Alan and the others for making us more than just a community group reacting to a succession of crises. Tony Larkum badgered me into making myself available for the management committee 36 years ago. It was he who badgered me into becoming secretary quite soon after. It was he who was president of the Society during the time much of the spade work was being done for Bicentennial Park and Blackwattle Bay Park. I well remember Tony when Blackwattle Bay Park was just rubble intended for the development of four-storey blocks of units. The developer had title to the land. We had somehow got the notion that it should be park. It was fenced off, but Tony, and the locals, led by Eric Gidney, convinced us that it really was our park by planting trees on the site. I still recollect Tony watering these pathetic plants, not to mention tending his mangrove plants down at the water’s edge. But it was enough to convince us it was our park. And wasn’t it Tony who led our campaign against the dry boat storage? Nick O’Neill doesn’t live in Glebe. Indeed he hails from Balmain, but nobody has made a more effective contribution to our waterfront than Nick. He knew of our vision for waterfront open space when all the local groups similar to ours formed the ‘Four-shores Committee’ to lobby for open space where previous waterfront industrial sites were vacant or were being used for non-waterfront industrial purposes. It was our good fortune that Nick became Deputy Mayor and Convenor of the Parks and Open Space Committee on the wonderful Evan Jones Leichhardt Council of the early ‘80s. It was Nick who saw the opportunity of linking our vision with the millions of dollars that would be sloshing around for Australia’s Bicentenary Celebrations. Nick contracted Sydney’s pre-eminent landscape architect Bruce Mackenzie, in consultation with community representatives, to produce draft plans which we then, under Nick’s leadership, carted around to anyone who mattered. Nick had retired from Council well before the park reached fruition, but his contribution was paramount. And I should add his role in achieving Blackwattle Bay Park was no less significant. I suspect Jack Ferguson doesn’t appear in the documentation recording contributors to our waterfront environment. He was Deputy Premier in Neville Wran’s government, but his great work was done for us in his role as Minister for Ports where one of his responsibilities was managing the government’s waterfront land assets including those owned by the government on Rozelle and Blackwattle Bays. He was the only politician who seemed to understand that goods being brought to waterfront sites by truck, stored, and then taken away again by truck did not constitute a waterfront industry. He would always listen to our arguments, our pleadings, our bleatings, nod sagely, say little, do little. But the little he did ensured the future of the Bicentennial Park and the waterfront walk. And what were these little things of such consequence? He ensured that no long-term leases were granted over the sites that became Bicentennial Park, and he handed to Leichhardt Council care and control over myriad tiny, useless but vital waterfront pieces of land that ensured the continuity of the waterfront walkway once the major sites could be secured. The campaign for Bicentennial Park Stage 1 (the Glebe side) lasted 20 years. The campaign for Stage 2 (the Annandale side) was to take a little longer. And while we worked very closely with the Annandale Association, and later the Save Rozelle Bay Campaign throughout, it’s best we stick to Stage 1 here. At the genesis of the Glebe Society, Federal Road continued from Glebe Point Road straight through what is now the centre of Bicentennial Park over Johnston Creek Canal, by what was then the road bridge, to Minogue Crescent. Between Federal Road and Rozelle Bay there were unused/misused (previously waterfront industrial) sites. At the bridge there was the long-since-abandoned Purr Pull petrol storage site. From there to Pope Paul V1 Park there were sites that in an earlier era had been served by lighters and had been legitimate waterfront timber millers: raw product in by water; finished product out by water. By 1969 some of these sites were abandoned. Others were used as timber storage or as non-waterfront industrial timber workshops – in by truck, out by truck. From its inception, the Glebe Society has had a policy supporting legitimate small scale waterfront industry in our bays, but these sites had ceased to function within that policy. During the first fifteen years of our campaign we had no formalised plan for the potential park. We had vague ideas of what it should look like, but our emphasis was on trying to have the politicians recognise the logic of our arguments – these sites were not being used for their zoned purpose, so they should be handed over for open space. And after all, we added, there had been a halcyon period before the threat of World War II when there had been public access to most of these sites including the earlier incarnation of the Police Boys Club with its tennis courts and the University Rowing Club right in the centre of the area we were seeking. It was the coming of the Evan Jones/Nick O’Neill council, the approaching Bicentenary and real plans to take to the politicians (see Bruce Mackenzie’s plan next page) that gave us our boost. Suddenly we felt we were getting somewhere. No longer did we feel the politicians were just being polite listening to us. Now they were actively interested. Leichhardt Council formed a Bicentennial Committee, and as Glebe Society representative, Neil Macindoe’s job was to make sure the Bicentennial Park remained at the top of the list for the next four years. This was the only way to guarantee the proposal received funding, while everyone and their dog put up their favourite scheme in the hope it would get on the list, and of course without funding there would have been no park. There were more trials and tribulations along the way: the state government’s attempt to offer Stage 1 if Stage 2 were to become a marina; squatters taking over some of the buildings after the decision had been taken by the government to develop the park and asbestos discovered prior to demolition. Although Bicentennial Park is not finished – the fountain from the original plan was deemed temporarily expendable in the interests of the budget (and replaced by four flagpoles!) – it remains the jewel in the crown. Let’s hope its ambience is not lost by what is about to take place opposite, and let’s hope the fountain completes it before too long. 2009 marks 20 years since the completion of Bicentennial Park (it was opened unfinished in 1988). Perhaps the fountain could mark the celebration. The campaign for Blackwattle Bay Park, officially opened in August 1983, is my favourite. The campaign for Bicentennial Park was long, drawn out and full of intrigue and political conspiracy, but it lacked a big climax on the way to its conclusion. Blackwattle Bay Park (and the rescue of Bellevue), by contrast, suddenly happened. It too had been part of our founding fathers’ plans, but the campaign for it had to follow a different route from Bicentennial Park because the potential park site here did not involve politicians. When the massive site, bordered by Blackwattle Bay, Cook Street, Leichhardt and Oxley Streets and the older multi-storey developments on Cook and Leichhardt Streets, was bulldozed to make way for a new development, locals like Eric Gidney (no longer of Glebe), Chris Hosking and Bob Armstrong (two old stagers) kept a close eye on any activities on the site. They worked closely with Tony Larkum’s Glebe Society Management Committee invariably having their representative already on the committee make regular reports. A report of great significance advised when the site was cyclone-wired into two areas: the area away from the water, Parkes Developments’ Stage 1 of the development; and the waterfront area, their final stage. The locals and the Glebe Society saw their opportunity – turn the waterfront area into a quasi park. Like all successful campaigns, viable ideas and plans were offered as an alternative to those intended by the developer. Simple landscape plans were drawn (the eventual professional ones by Stuart Pittendrigh for Parkes Developments and Leichhardt Council were infinitely better); Chris Hosking drew up plans for a viable use of Bellevue; and Tony Larkum and some cohorts somehow penetrated the fencing, planted trees on the site and watered them. We actually thought the site was ours! Not an unreasonable expectation, given that at this stage Pope Paul VI Park remained our sole waterfront open space. Herein follow the reasons why I love this park so much. The next report of great significance came a year or so later. There was no time to consult at formal meetings. The message went around by telephone, ‘The cyclone fence has been removed and there are bulldozers on the site!’ As was inevitable, the work was to begin on a weekday. Receiving the message in many circumstances were the wives at home looking after the babies. I’m proud to say Deanne heeded the call, gathered the kids into the car, drove onto the site where the bulldozers were poised to join the others and, sadly, ripped the sump out of my beautiful Mini. Ah! Those were the days – environmentally conscious unions; the influence of Jack Mundey AO (recently made a Life Member of The Glebe Society); local activists who didn’t realise they were asking for the impossible… In short, the bulldozer drivers shut down their machines and contacted their union chiefs. No further work took place. A couple of days later a meeting took place with the unions, the developer and Leichhardt Council in attendance, with the Glebe Society and local representatives as observers. The resolution was quick: the waterfront site would be developed as a park by Parkes Developments to a plan approved by Leichhardt Council and would then be handed to Leichhardt Council and Bellevue would be preserved (but not fully restored) by the developer at a cost of $25,000. The developer could then continue with the rest of the development unimpeded. The only thing missing from the perfect scenario was the developer’s failure to preserve Bellevue. Instead, he continued with his policy of demolition by neglect. Fortunately, a little later Leichhardt Council arranged for the Heritage Council to spend $30,000 on that preservation/holding operation. Again, Glebe owes a big thank-you to the Evan Jones Council and particularly to Nick O’Neill. 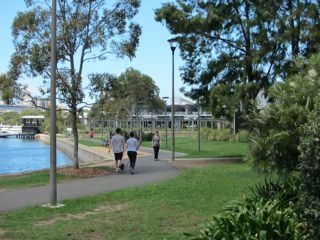 Again he involved us in the planning for the park and ensured it became a most attractive waterfront open space. The Foreshore Walk is all but complete. The section in front of the high school, Pyrmont Bridge Road Wharf, the Fish Markets and the area towards Pyrmont remain to be sorted. But let’s not get ahead of ourselves. Let’s look at what we have and how it came about. Before I get too rigid about sites, it’s worth noting the boost that came with our move to the City of Sydney Council. That’s not to say nothing had been achieved by Leichhardt Council. Plenty had, but the resources of the City of Sydney have ensured it has all happened more quickly. The accelerated pace began under Lucy Turnbull, who came on our waterfront walk early in her short stint as mayor. She recognised the need to complete the transfer of the Anchorage waterfront site quickly, and the need to restore Bellevue which, by now, despite the holding operation 25 years ago, was in a desperate state of disrepair. The next council, under Clover Moore, has really got on with the job and sees our foreshore walk as just a part of the much grander scheme to create a foreshore walk right around that part of the harbour’s southern shore contained within City of Sydney Council’s borders. Two of the major parts of the walk, Bicentennial Park and Blackwattle Bay Park, have already been covered here, but the acquisition of some of the other significant areas now get a mention. The acquisition of the land in front of 501 Glebe Point Road, now Pavilions, had an enormously long gestation. This, like all the other sites that were to become a part of the foreshore walk, was identified and tagged by our founding fathers at an early stage. Forty years ago the entire site was occupied by a series of large warehouse-style buildings, each containing wonderful timbers in their frames but with little else to recommend them. Most of the walls were brick, including all of those visible from Glebe Point Road, but once inside there was a fair smattering of corrugated iron and fibro as well. The site was much higher at Glebe Point Road than at the waterfront, but the height differentiation was not taken up by a general slope but rather by natural rock platforms. An architect’s dream! At this stage the major building was used to receive logs (by now brought in by truck) from which plywood was manufactured. The plywood was taken by forklift down Federal Road and stored, then taken out by truck. Not a legitimate use of a waterfront industrial site! By the late ‘70s, a new incarnation of Parkes Developments, the same developer who had built so many of the units in Glebe, acquired this site and applied to Leichhardt Council for it to be rezoned. His initial application was based on a huge number of small units occupying the entire site. He was advised immediately that unless he was willing to cede a substantial piece of waterfront land to Council, and unless he reduced the number of units, he would not succeed in his rezoning application. He indicated quite early a willingness to cede the waterfront, but despite many on-site meetings with Council and Glebe Society representatives, still kept coming up with plans for around 68 units. We appeared to be getting nowhere. Then suddenly, with no further discussion, he made a rezoning application to Council which included in the ‘envelope’ the ceding of the waterfront and 31 units over the rest of the site. The site was rezoned with great alacrity. But that was thirty years ago. The developer had got his rezoning based on his ‘envelope’ plan. The sketch drawings for the buildings were interesting but impractical. They were to be two-storey terrace-style at the Glebe Point Road level, then multistorey unit and townhouse style at the lower level. This developer, falling on hard times, sold the building site on. The next owner submitted a formal development application and building application and received approval, but he too subsequently experienced difficulties and put his development plans on hold. He leased out various parts of the buildings as ‘art studios’ to keep the wolf from the door, then when the real estate climate improved he ejected the tenants and sold the site on to the developer who built what is now Pavilions. But none of this mattered greatly. We had the waterfront and thus the next stepping stone along our foreshore walk. The Anchorage next door to Pavilions provided the next stepping stone. Forty years ago there was still a disused/derelict house at the top level with an equally disused/derelict tennis court fronting Glebe Point Road. At the waterfront were the remains of a Victorian/Federation harbour pool. The entire site at the upper level was surrounded by a new, exceptionally tall, paling fence. By the early ‘70s approval for the Anchorage had been granted and demolition began around 1974. The site comprised two clear levels separated by a sheer cliff. No attempt was made to build on the lower level and the waterfront remained for the exclusive use of the occupants of the Anchorage with access provided by a suicidally steep steel ladder down the cliff face. It really wasn’t of much value to the proprietors. The Body Corporate was approached consistently from its inception to ask them to consider selling the waterfront to Leichhardt Council. The decision would have to be unanimous on the part of all owners and always we got the answer back that just one owner refused. The status quo continued for 25 years before someone from Leichhardt Council, more persuasive than we or Council had ever been, managed to get a positive response. The conclusion of the deal still dragged until Glebe’s transfer to the City of Sydney Council resulted in the deal being consummated with great urgency. Finally, I’d like to make a quick reference to a few more of the sites and call it quits, but with the hope that others more qualified than I might tell the stories of these sites. 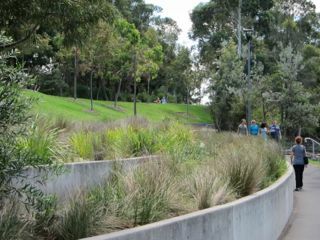 The next sites along the path before we reach Blackwattle Bay Park were referred to earlier and had come to Leichhardt Council as surplus to the government’s ports needs. The exception here is the Harbour Lighterage site (now Bridgewater) which proved to be a saga settled in the Land and Environment Court. Here an aberration dating to Harbour Lighterage’s use of the site involving ownership into deep water favoured the developer. We did not get what we wanted but the result is better than we might have expected. The next site after Blackwattle Bay Park, on the southern side of Cook Street, was also settled in the Land and Environment Court. We were well prepared, expecting to gain a substantial strip along the waterfront but gaining a miserly strip. It is the one near-blot on the foreshore walk. Thankfully, it is followed by the old Fletchers’ Container Storage site and Council’s storage site, now combined as the Australand development, where we gained a waterfront area commensurate with our deserts. The High School site too is a story on its own. While we don’t have complete free and open access, the alternative would have excluded us from the site whereas, as public land, Council has been able to negotiate access along the waterfront. That section of the walk is scheduled for completion in some time in the not too distant future.